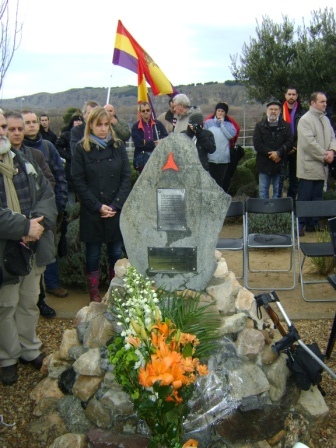 Friends of ALBA will be pleased to know that there is a new monument to a member of the International Brigades in Spain. 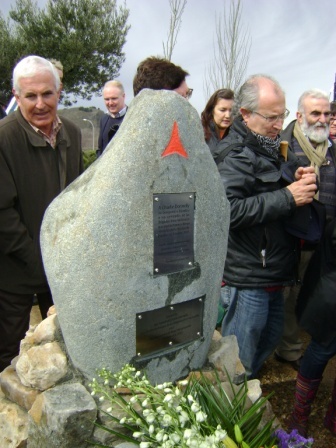 The monument, to the Irish brigadista Charlie Donnelly, was dedicated in February 2010, on the 72nd anniversary of his death in the Battle of Jarama. Charlie Donnelly was a poet of great promise and an organizer of the Irish Republican Congress. He was a member of the Connolly Column, the term for all Irish who fought for the Spanish Republic. Of special interest to friends of ALBA, he fought with the Lincoln Battalion, as did many members of the Connolly Column. The monument dedication completed a project begun in 2007 by the Friends of Charlie Donnelly with the help of the Asociación de Amigos de las Brigados Internationales (AABI). The city council of Rivas Vaciamadrid provided the site and collaborated in the project. (Rivas Vaciamadrid is on the southeastern outskirts of Madrid and close to where the battle of Jarama took place.) The stone that formed the centerpiece of the monument was taken from a quarry near Charlie’s birthplace in County Tyrone. It was set in a cairn of 32 stones brought from Ireland and the rest from the Jarama battlefield. The dedication of the monument took place on February 27 at the Parque de Miralrio de Rivas Vaciamadrid. I had the pleasure of attending, and was struck by the broad representation of speakers: from AABI; Friends of Charlie Donnelly; the Dungannon Mayor’s Office; PSOE (the left/center governing party in Spain); IU (the coalition of left and green parties in Spain including the Communist Party); the Donnelly family; the Ambassador from Ireland; and the Mayor of Rivas Vaciamadrid. These events were part of the Third Annual Memorial March at Jarama organized by the AABI, International Brigades Memorial Trust (IBMT), Friends of Charlie Donnelly and Republican Ateneo of Fuenlabrada with the collaboration of the City Council of Rivas Vaciamadrid and Club de Amigos de la Unesco de Madrid. Courtesy of the organizers, participants such as myself had opportunities to visit other places in Spain that were of significance in the Civil War. For me, the opportunity to see a monument to a brigadista become part of the Spanish landscape was inspiring, as was the opportunity to spend time with people from other countries who share these feelings. I encourage others to make similar trips. For more information on such opportunities, helpful sources include the IBMT website; the Portal de la Historia website; and Alan Warren at hill705@gmail.com.